Combine first 5 ingredients in a large bowl; add eggs and oil, stirring until dry ingredients are moistened. (Do not beat.) Stir in vanilla, pineapple, 1 cup pecans, and bananas. Pour batter into three greased and floured 9-inch round cakepans. Bake at 350° for 25 to 30 minutes or until a wooden pick inserted in center comes out clean. Cool in pans on wire racks 10 minutes; remove from pans, and cool completely on wire racks. 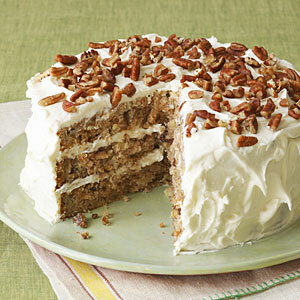 Spread Cream Cheese Frosting between layers and on top and sides of cake; sprinkle 1/2 cup chopped pecans on top. Store in refrigerator. Cream Cheese Frosting: Beat cream cheese and butter at medium speed with an electric mixer until smooth.